Jan Smith, Founder of S3 Inc.
2 November 2018. 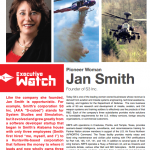 In the September/October issue of Rotorcraft Pro Magazine, the Popular Rotorcraft Association (PRA) featured CEO Jan Smith in its Executive Watch section. Lyn Burks (President, Owner, and Editor-in-Chief of Rotorcraft Pro who has professional and personal links to the Huntsville community) chose Jan Smith for his long-running feature section on Chief Executive Officers who have made significant and lasting contributions to Rotary Wing Aviation. The three-page article traces Ms. Smith’s early life from mathematician and NASA software developer to successful Entrepreneur in the defense and aerospace industry. Rotorcraft Pro’s direct distribution reaches more than 63,000 industry professionals each month through print, digital and app media. Visitors from more than 200 countries view the magazine with an estimated total viewership of 282,000.